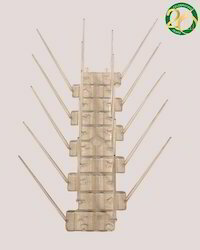 Pioneers in the industry, we offer ss spikes, pigeon spikes and 4 row pigeon spikes from India. 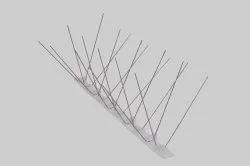 A bird control spike, also known as an anti-bird spike, is a device consisting of long, needle-like rods used for bird control. They can be attached to building ledges, signs, windowsills, roof perimeters, air conditioners, support structure, awnings, poles, lights, statues, beams, trusses and building projections. 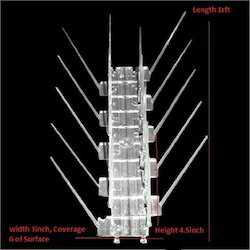 We have successfully introduced PESTGO-4th Generation Spikes -An Ultra Violet Stabilized Polycarbonate against Bird Menace, first time in India under the technical collaboration of M/s. Hughes Hughes Limited of United Kingdom with remarkable results. it covers 4.5 inch on top and 6 inch at the base. The maximum thickness of the base is 4mm. The length of each piece is 1 feet. Packaging Details: Packing Size is 20 Pcs. each in one corrugated box (CBS).